Life is a story you write yourself. Is yours worth telling? Craft a tale for the ages! Jolicraft can help. Jolicraft is available wherever you play Minecraft! Minecraft: Java Edition is the original version of Minecraft developed by Mojang for Windows, macOS, and Linux. 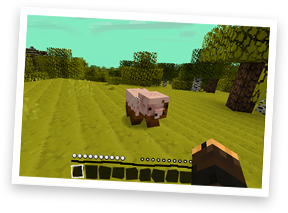 Minecraft: Bedrock Edition is a multi-platform version of Minecraft (previously 'Pocket Edition') for iPad, iPhone, Android, XBox, Playstation, Nintendo Switch, etc. 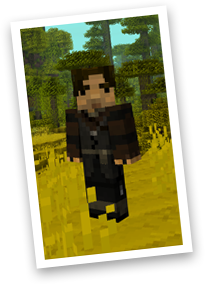 My name is Jolicoeur, so I called it Jolicraft. It's pronounced "Jolly Craft" by the way. My name means "Happy Heart", so I guess Jolicraft means "Happy Craft". So maybe I should have called it HappyCraft, because I'm generally quite happy. But I'm not always happy. Sometimes I run out of coffee. Sometimes there's no hot water for my bath. These things make me sad. But then I just go and play some Minecraft and I'm happy again. Because Jolicraft. Minecraft is a game about crafting the world around you. What better way to craft the world than to craft the very stuff the world is made of? I had a great time creating Jolicraft, it's so addictive to create textures and see them live in your own world. I didn't really intend to push the pack as far as I did, but damn this stuff is addictive. It's as addictive as Minecraft itself, which is saying alot. This is Minecraft people. As with life, don't take it too seriously. A good plentiful helping of Jolicraft will wash the dust away from your dreary world. * Wash the dust away from your dreary world! * Boat, cart, sign, sun, moon, bed, biomes, et cetera! * Custom animated water, lava, sky colour, water colour, and more! * Tastes like grilled cheese and chocolate milk! 1. Download the jolicraft zip using the download button above. 3. Select "Options", and then select "Resource Packs". 4. Select "Open Resource Pack Folder". 5. Minecraft's Resource pack folder will open. You must drop the jolicraft zip in this folder. 6. Go back to Minecraft. 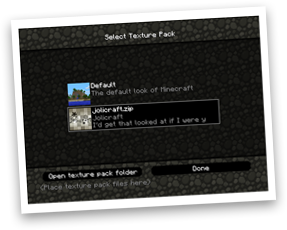 You'll now see Jolicraft in the Resource pack list. Select it! 7. Be sure to check back often for updates! I add new stuff all the time. Why did you make this 16x16? Wouldn't it be awesomer if it was 32x32 or 128x128 or 1080x1080? I love 16p texture packs. It seems the perfect resolution to match the style of Minecraft. The purposefully crude low-res pixel crafting nature of the game was simply made for 16x16 textures, anything more just feels weird - like drinking red wine while eating hotdogs. Which Notch does every morning at the breakfast table. Pixels are beautiful my friend, and in a grid of 16x16 they're damn near perfection. I asked you to change a texture and you didn't. What gives? I'm sorry. You had good intentions in suggesting a change, but I didn't care for it. Don't be angry! I don't care for lots of stuff that other people like. And I care for lots of things that other folk don't like. And I'm neutral to things that many people aren't neutral to. What a world! Does that answer your question? I'm making my own pack or map, and I want to use a texture from your pack. Can I? I get lots of requests from folks asking if they can use specific textures in their packs and maps. As long as you're not using them for profit, I don't mind if you use any of my textures, help yourself and enjoy! But I just ask that if you do use something I've made that you state somewhere in your info what you used of mine, and include a link to jolicraft.com. And I STRONGLY encourage you to not rely on anything I've made. Making a few textures doesn't take long. It's much more satisfying to create something original than to rely on someone else's creations. Wouldn't you agree? How can I get the coloured sky from your screenshots? If you're on the Java Edition, you can use a program called Optifine to add the ability for Minecraft to recognize and use the custom sky colours I've added. As an added bonus, Optifine will optimize your game, make it run better, give you the ability to tweak your graphics options, allow you to easily install shaders, and more! Which version of Minecraft do you prefer? Java Edition is my first love. Bedrock Edition is my soulmate. Both are important parts of my life. But only Bedrock lets me easily play with my kids. Only Bedrock lets me share Jolicraft with folks who play on iPads and XBoxes and whatnot. As powerful and flexible as the Java edition is, I wish it would keep up with Bedrock's ease of use and optimization. Just like in real life, Survival is the only mode. Once when I was young I pushed a toothpick into my ear and it went all the way in and didn't come out. I've not been quite right since then. I spend lots of time in the Jolicraft thread at minecraftforum.net. There's lots of fun stuff going on all the time, like contests, sneak peaks, and random craziness. Stop by and say "Hi", or "I love Jolicraft", or "Hey, I'm your long lost twin brother" (if applicable).